Many, many years ago I was taking a graduate class taught by a research MD from UCLA Medical School in Los Angeles. Talking with him after class one day, he was complaining about FDA policy. He was involved in some cancer treatment research and was very frustrated. They had been researching some earlier work on a couple of “failed” drugs. Each of these drugs had a less than 20% success rate in the cancer trials. However, they found when the two drugs were combined, given together to patients, they were getting over an 80% success rate. FDA drug policy, at least at that time, was a single substance for a single disease. They would not license combining two “failed” drugs for treatment. Later, during my doctoral and post-doc training, I was being taught about the benefits of synergy in herbal formulas. Here I learned that 1+1 does not always equal 2. When certain herbs are combined, 1+1 might equal 6 … or even more. While this concept is actually thousands of years old in Traditional Chinese Medicine and the Ayurvedic tradition of India, it was just being re-discovered in Western science. When treating men’s prostate issues (BPH or benign prostatic hypertrophy), it was found that a therapeutic dose of the herb, Saw Palmetto (Serenoa Repens), is 320mg. Another popular and proven herb for the condition is African Pygeum (Pygeum Africanum), with a therapeutic dose being 300mg. However, it was found that you could combine just 100mg of each herb and the effect was 6 times stronger! (A total of 200mg was 6 times stronger than 300mg or more of the individual herbs.) This is the power of synergy. I should also mention that the opposite is also true. It’s known that some herbs, individually beneficial, when combined, cancel one another out and there is no benefit at all. 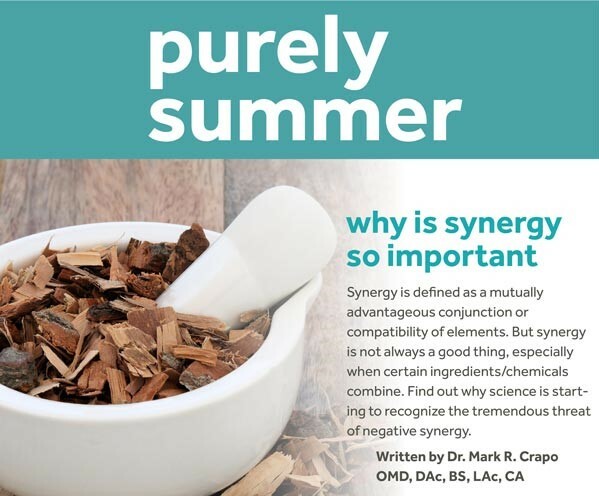 But, back to synergy… Unfortunately, our FDA, EPA and other National, State and local scientific organizations don’t always address or even recognize synergistic properties. Equally unfortunate is the fact that synergy is not always a good thing. Some harmful ingredients/chemicals can combine in a very harmful synergy. A recent article, Consumer Product Safety Testing Misses Cancer Risks From Chemical Mixtures, by Olga Naidenko Ph.D., Senior Science Advisor for Children’s Environmental Health, addresses this growing problem. The article looks at the aggregate effect of BPA, a plastics additive; methyl paraben, a preservative in cosmetics and body care products; and PFOA, a non-stick chemical formerly used to make Teflon, on breast cancer. She says, “In tests for the study, when all three chemicals were present together, they changed breast cell biology in a more profound and consequential way than each chemical individually.” In other words; a very negative synergy. We know that small amounts of toxic chemicals, ingredients commonly found in so many, or even most, of the personal and household care products people use every day, can be dangerous to our health because of bio-accumulation, a build-up over time. And now science is starting to recognize the tremendous threat of negative synergy; very small amounts of some ingredients combining to cause more immediate and more significant health issues. Live toxin free by avoiding these ingredients, thereby avoiding the negative synergy and health issues that toxins can cause.